Bike Light Selection, originally uploaded by [Zakkaliciousness]. The local supermarket had a sale on funky bike lights. For kids and adults. Giving you the chance to personalise your bike even more. Each package has a red and a white light. 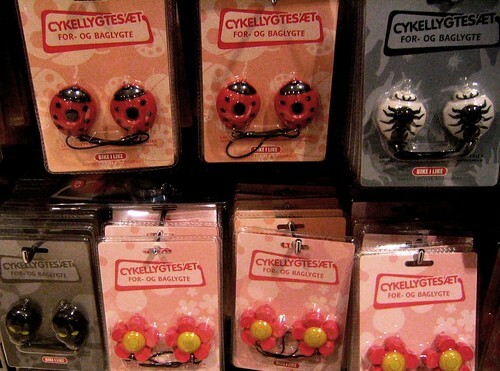 Despite the kitsch nature of this selection, they all adhere to the very strict bike light laws in Denmark. These kind of lights are held onto your handlebars with an elastic string. Easy to pop on and off and to carry in your pocket. tags: "bike accessories", "bike lights", "personalise your bike"